Most successful real estate agents use CRM software in some capacity. This makes sense, as agents generally find themselves having to juggle many different clients at once, and these clients need to be easily distinguished from one another. But effective real estate CRM should be more than just a database of clients; the best real estate CRM should be an intuitive, customizable tool designed to be able to automate certain important functions and retrieve accurate data in real time. Although a high percentage of real estate business comes from referrals, word-of-mouth is not the only source of new leads. Agents will likely also use websites, online and offline advertising, direct mail, social media, and other channels to bring in new clients. This means potentially higher returns, but it also means more information from a variety of sources that all need to be organized. Superior CRM tools can consolidate these diverse sources into a single database, accessible from any platform or location, making information retrieval a quick and painless process. Between meeting clients and other agents, showing properties, and performing almost countless other duties in and out of the office, real estate agents don’t generally get to spend their workday sitting down in front of a computer. Still, the advantages provided by computerized technology can make an agent’s job much easier, even if they can’t always bring the office computer along with them. CRM that is designed for full functionality on portable smart devices. Using cloud-based real estate software means that agents will have full access to the technologies they need, no matter where they might be. Although real estate agents generally have many clients, each individual client expects to be treated as though they are the only one that matters. After all, purchasing property can be a daunting, expensive commitment. As such, when a client contacts a real estate agent, they expect a fast response. 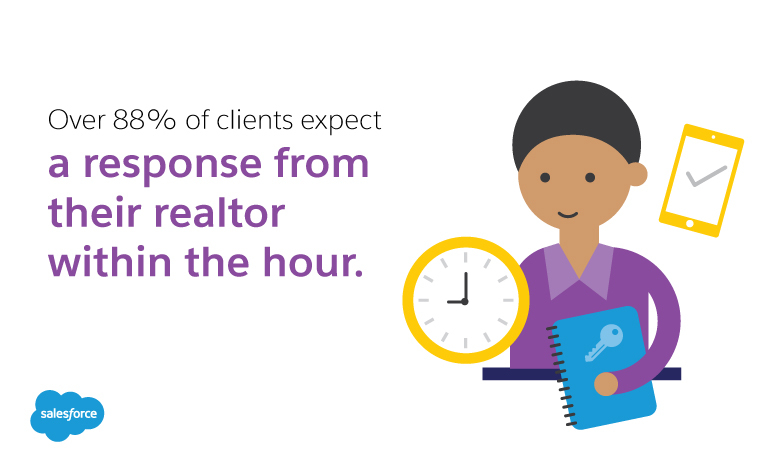 In fact, over 88% of clients expect a response from their realtor within the hour. The ability to respond immediately to inquiries of all kinds plays a key role in realtor success. CRM can be customized to send direct messages and reminders to the agent in the event that a client is attempting to get in touch, even through such less-conventional sources as social media, and can also be customized to automatically respond to certain queries in a way that is personal and appreciated. An effective, reliable agent can make all the difference in finding the perfect property, which means that clients who are satisfied with the quality of service they’ve received from their realtor are very likely to recommend that realtor to others, and to also use that same realtor the next time they are in the market for real estate. This is so pronounced, that as much as 88% of all real estate transactions come from repeat and referral business. But in order for agents to be able to benefit from this, they need to maintain contact with those clients who have already completed the customer journey. As much as 74% of clients are willing to give their former realtors referrals, provided that the real estate agent remains in contact after the sale is completed. CRM solutions can be used to send regular, automated messages (such as open-house invitations, follow-ups, and even holiday greetings) to former clients, and can be integrated with any communication channel available. Real estate is not an industry comprised of many small transactions; it’s an industry made up of fewer, large-scale transactions, each of which might represent a meaningful time investment on the part of the realtor. Because of this, when things begin to go wrong, clients may start to drop out of the process, and sales run into difficulties, realtors need to be able to identify any potential problems quickly or risk suffering significant losses. A real-time data-gathering-and-presenting technology of CRM tools means that realtors have the advantage of being able to respond to situations as they develop, rather than having to wait for a quarterly report. Realtors can also easily review their yearly earnings, see which campaigns are most successful, and identify which client interactions are most profitable—all by accessing the data in real time. Although many CRM tools offer similar functionality, the reality is that some tools are better suited to meet the real estate needs more than others. In order to identify which tools are best equipped to serve the needs of an individual realtor, one must first take a step back and identify that realtor’s specific needs. In addition to the challenges detailed above, every real estate agent will have his or her own unique obstacles. 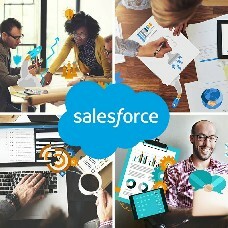 By recognizing these obstacles, and then researching highly-rated CRMs to determine which ones provide the most-complete solutions, relators can narrow down the field of prospective choices, and CRMs that offer free trial periods, such as Salesforce, allow users to get a more accurate feel for how effective a specific CRM will be, without having to commit valuable resources to do so. When all is said and done, the most-advantageous CRMs for realtors are those that provide simple usability, high-customization and flexibility, and that integrate easily with any existing systems, processes, or databases. Additionally, the ability to share data across multiple channels can be invaluable, allowing realtors to use that data when creating various marketing campaigns. 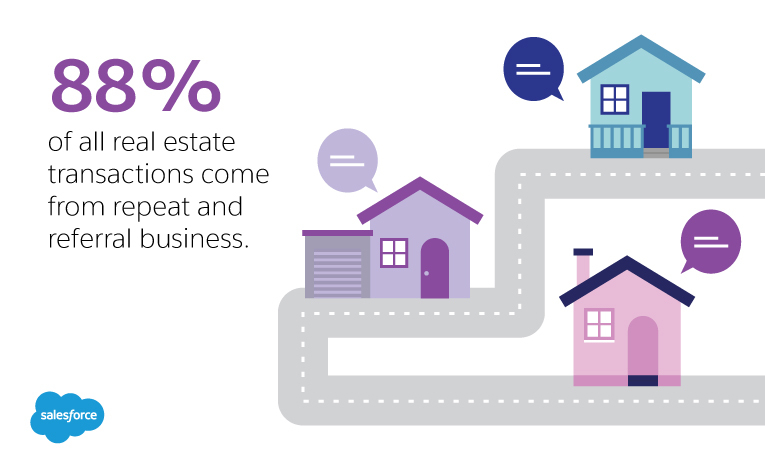 In the world of real estate, CRM is nothing new. However distinct from the simple databases and contact lists that have been in use for decades, advanced, automated, cloud-based CRM that allows realtors to view and interact with data in real time has the potential to completely change the industry. Those realtors who locate and commit to an effective CRM solution will find themselves well ahead of the curve in regard to how their customer relationships are managed, which is perfect for those real estate agents who believe in the ‘reality’ of their dreams.